With back to school comes our daily commute of 30 minutes each way. Since turning to audiobooks, the ride has become much more peaceful. Not only that, but my girls are absorbing great literature and stories. Check out this Read Aloud Revival Podcast for the many benefits of sharing audiobooks with your children. After finding less and less time to sit down with a good book, I have turned to audiobooks myself. I listen in the car (remember half of my commute is sans kids), while sewing (yes, this has lead to a few distracted errors), and while putting on my makeup. You would be surprise at the number of occasions you can find to listen to a snippet or two. 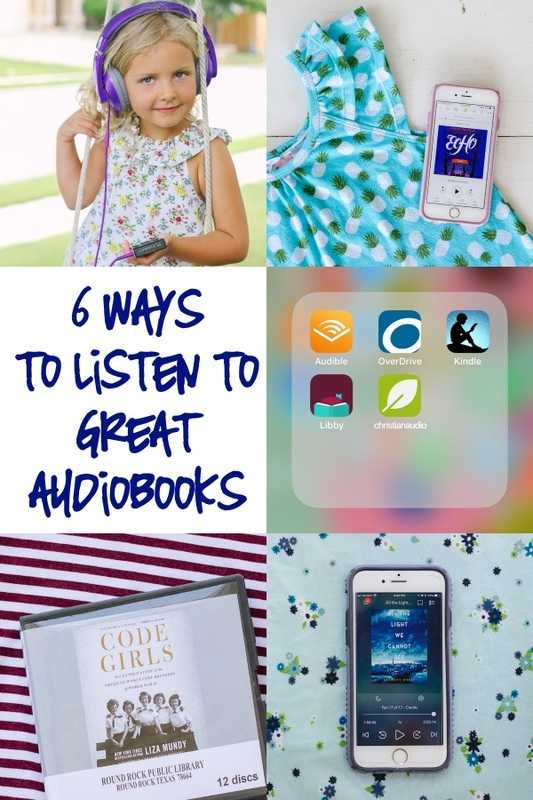 This brings us to the variety of ways to obtain and listen to audiobooks. This is probably my least favorite method since the discs prove to be less mobile. I usually reserve this method to something we/I will only listen to in the car. Playaways are available at most libraries. They are portable media players loaded with one audiobook ready to play. Users can plug in headphones to listen on their own or use an auxiliary cable to play over a car or stand alone speaker. The Playaway device is about the size of a deck of cards. I love these for kids, because I can rest assured that they are not using the device for gaming as well as listening. You do not need an Audible subscription (aff link) to take advantage of the books available through the Audible App. The books available without a subscription are not free; however, Read Aloud Revival keeps a running list of deeply discounted children's and family titles. Overdrive happens to be my most frequently used app for audiobooks. I link up each library I have access to and search for available titles. In addition to my local library, Houston Public Library offers a free digital card, so check for other libraries that may have a similar opportunity. The more libraries you are able to search, the wider the variety of options. Libby seems to be the latest app by Overdrive. Everyday Reading just posted a review on Libby vs. Overdrive, and I suggest checking that out. I keep returning to Overdrive, so I don't have much first hand experience with Libby. Christian Audio is another great source for audiobooks. They are currently running a $5 fiction book sale, so be sure to look through their listings. We've found J.R.R. Tolkien audiobooks as well as the Wingfeather Saga Series by Andrew Peterson which is a family must read! As I was typing this post, my mom happened to mention RB Digital, so I'm passing it along as one more avenue to explore. Thank you for the share! I likes music very much and always listen 10 to 20 songs daily. Having read this I trusted it was to a great degree information. I welcome you investing some energy and push to assemble this data. I indeed end up expressly investing an abundant excess energy both reading and remarking. Also go for the best writing help from fast and cheap essays.